It was a scheme that targeted victims across the St. Louis metropolitan area; Beginning in 2013, News 4 Investigates began receiving complaints about All Season's Contracting. 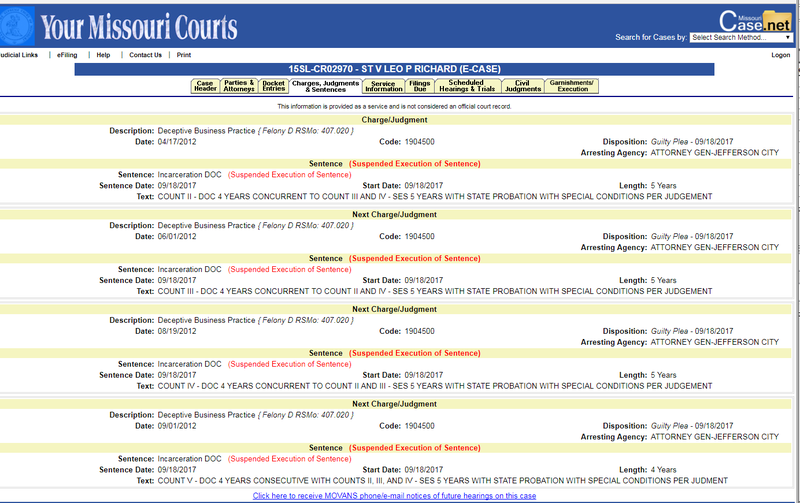 The Missouri Attorney General received 136 complaints from victims. A large portion of complaints involved large deposits stolen from homeowners. Steve Bohannon of Overland lost nearly $4,000 when the company took a deposit to replace his roof. His job was never completed. Mary Deboe of St. Louis County paid All Seasons Contracting nearly $6,000 to replace her roof. Her job was never completed. Leo (Patrick) Richard of Manhattan, Illinois was the owner of All Seasons Contracting. In September 2017 Richard pleaded guilty to multiple felony counts of deceptive business practice. Richard pleaded guilty following a plea agreement with Missouri Attorney General Josh Hawley's office. The deal kept Richard out of prison; instead of eight years, Richard received probation. He's also ordered to pay back $265,000 in restitution over the next 10 years. "It doesn't say much for the justice system," said Steve Bohannon. Bohannon suffers from chronic medical conditions and receives dialysis several times a week. "I will probably be dead before I get the money," Bohannon said. Mary Deboe is also questioning the plea deal saying, "I think it's ridiculous ... this was not a miscalculation." She points out Richard was accused of the same behavior in Ohio after leaving Missouri. In Ohio, the state's attorney general also prosecuted Richard and sent him to prison. Richard served approximately nine months for his Ohio crimes. News 4 questioned Hawley over the plea deal. Hawley responded, "he's getting probation, not prison, so that he can pay the money. We have a choice to make. We can send him to prison and victims get nothing back or we can make him pay back what he owes." According to court documents, Richard continues to live in a house valued at more than $400,000. Hawley explained, "What we looked at, at sentencing is all of his assets. What he had, what we could get our hands on based on what would give us a realistic chance at getting the money." The plea deal required Richard to pay $10,000 at sentencing on September 18. He will be required to pay $15,000 on or before November 17. After making the $15,000 Richard will be required to pay $2,000 per month for 10 years starting on December 1. Hawley made it clear that if Richard fails to meet his financial obligations "it's off he goes."